I am chagrined to report that I have still not had the time/taken the time to catch up on my blog. We are ever-moving ever-doing and it seems like there's no time to just sit in a quiet cabin and catch up (and there's SO much to catch up on besides the blog, when we've been out for the whole summer). - A week in Mili Atoll, where we were able to dive in flat calm conditions on a B-25 bomber shot down in WW2 off the end of the Mili airfield. Because the conditions were so good, we located, photographed, and mapped parts of the airplane that had never been located before. 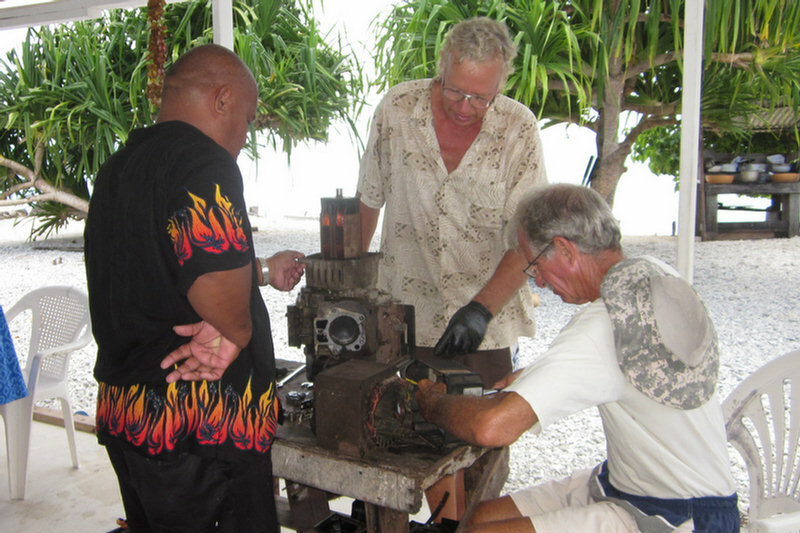 We have shared our results with the Historical Preservation Office in Majuro (and with Matt Holly, the original discoverer of this airplane). Plus of course, updating the existing blog posts with a few of the hundreds of photos we have taken! We are now on our way 90 miles north to Maloelap Atoll, where we plan to do some more diving and land exploration of WW2 sites. Tops on the agenda is to try to locate an as-yet-missing Corsair airplane reported shot down over Taroa Island in Maloelap. We have been trying to work with Matt Holly (who has been searching for this airplane for a number of years) and get a group of cruiser/divers together to do an organized search. Matt's been delayed and his disorganization has put off a couple of the boats that had expressed interest. But we and Challenger are going to get started anyway. We have enough information from Matt to know where he has determined the plan is NOT. 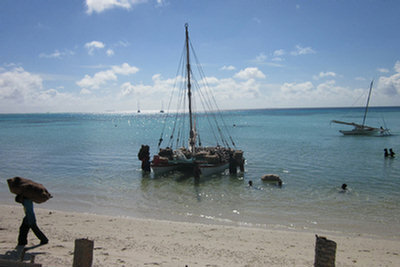 Hopefully Westward II will be able to join us in a few days (they are working on engine issues in Majuro). And maybe Matt will actually join us in a few days also--sailing up with s/v Tribute. The wind has been more or less "light and variable" for 3 weeks now, and the GRIBS look like it will stay that way for at least another week. Light winds are not unusual in the summer here, but a stretch this long with winds this light ARE unusual. It makes for terrible sailing but great diving. So on we motor... ETA Taroa anchorage in Maloelap around noon. Our future plans are to spend about 10 days in Maloelap, hit Majuro one more time for provisions, then stop in Jaluit (another Japanese base during WW2) on our way back to Kwajalein. We plan to leave Soggy Paws in Kwaj for October and November while we fly back to the U.S.
We finally made it to Ailuk! Ailuk Atoll is one of the "outer outer" atolls. That's why I wanted to visit here. 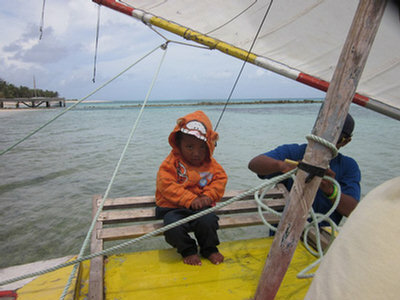 I also wanted to visit because "Pumpkin", one of the Ailuk islanders, is on the Yokwe Net (SSB) every morning. 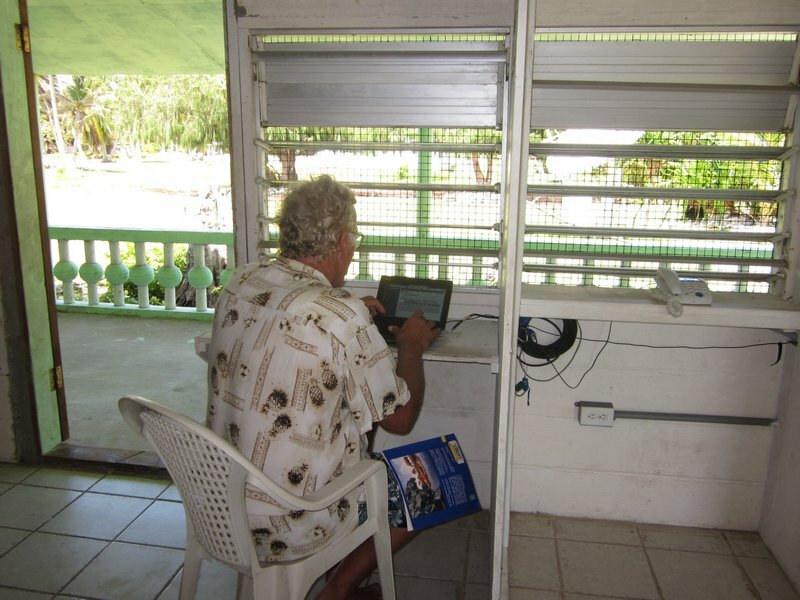 There are 3 or 4 Marshallese on different islands who participate in the HF net. Pumpkin has been asking for weeks when we (several boats out cruising this summer) are coming to Ailuk. 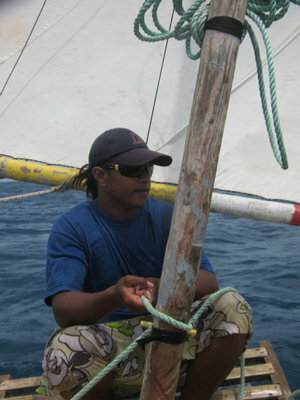 As we were laboriously tacking our way into Ailuk, we heard Pumpkin calling us on the VHF... welcoming us to his atoll. When we finally got anchored, he told us where his house was on the beach, and that's where we went first. Pumpkin's wife Emily greeted us with real flower lei's, and fresh coconuts. 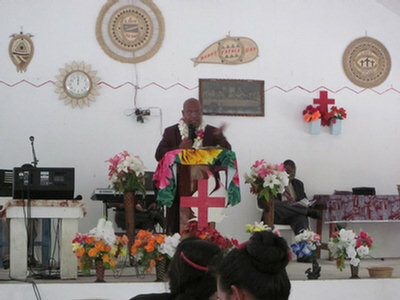 It turns out that Pumpkin is the pastor of the Assembly of God church here in Ailuk. 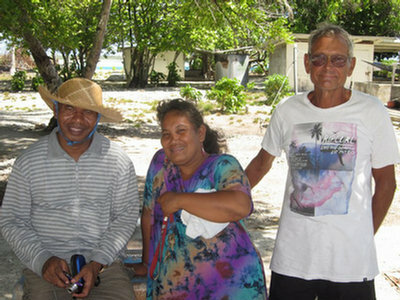 He and Emily grew up in Ailuk, but they went to high school in Majuro. They spent some time as pastor of a church in Mili, another Marshall Islands atoll. 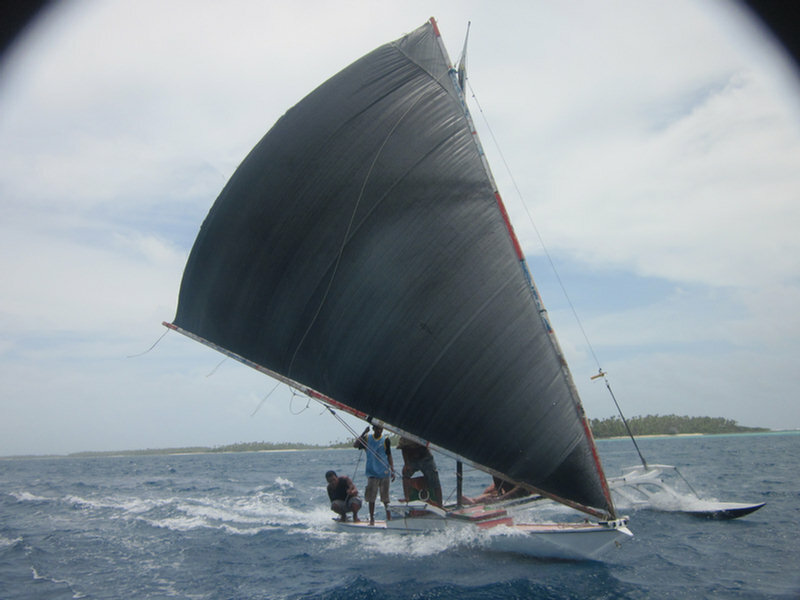 Ailuk is unique among the atolls we have visited so far, in that they use the traditional Marshallese sailing canoe in everyday use. 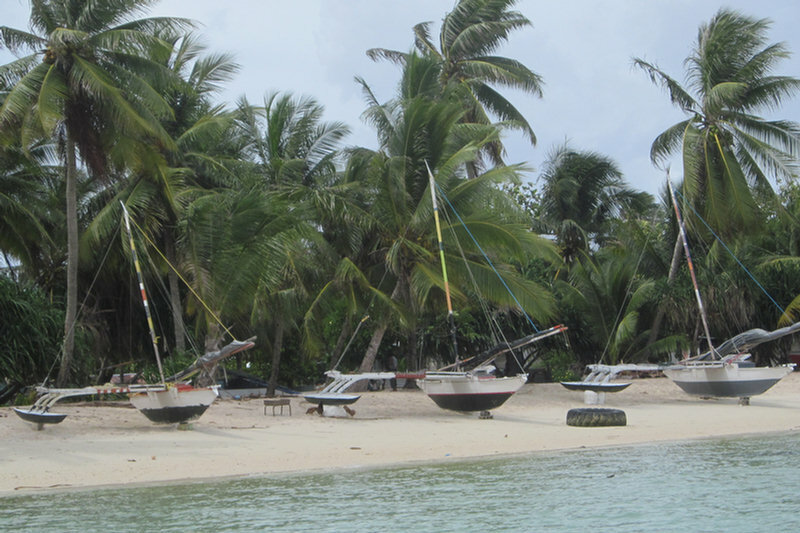 Most atolls have a few canoes sitting around under palm trees, but most of them are paddle-powered. We have never seen a traditional canoe actually sailing. 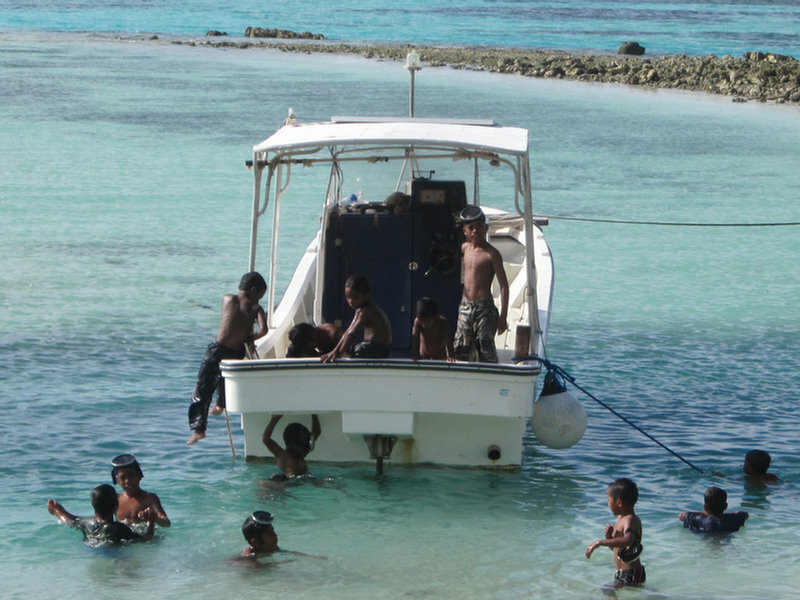 Here in Ailuk, they are the main means of transportation to the outer islands in the atoll. Ailuk gets a supply ship... maybe... every 3 months. They have a small weekly plane flight... maybe. Gasoline, if you can buy it, is $9-10 per gallon. 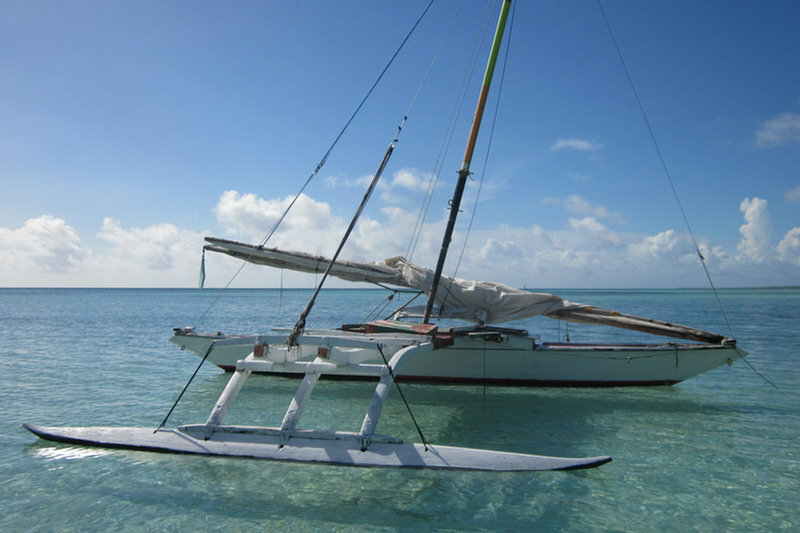 We have been amazed at how prevalent the fiberglass boat with a 25-45 HP outboard has been all through the islands (Tonga, Fiji, Tuvalu, Kiribati). They are always short of gasoline, and always struggling to keep the outboards running. 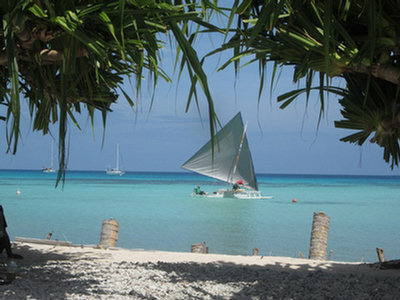 Most of these islands have totally lost the art of making, maintaining, and sailing the canoes. But not Ailuk. Ailuk is also one of the atolls that produces some of the best Marshallese handicrafts. The only "cash crops" in Ailuk are copra (dried coconut meat used to produce coconut oil) and the handicrafts. This they normally send to relatives in Majuro, who then sell it and send back by ship the things that the Ailuk people need. One of the first things we did after completing the formalities (showing our Internal Affairs permit for Ailuk, and paying our "atoll fee" of $50), was offer to help Pumpkin fix things. It is one of the common ways that yachties "give back" to the islanders for their hospitality. Pumpkin promptly produced a couple of broken inverters, and a generator. 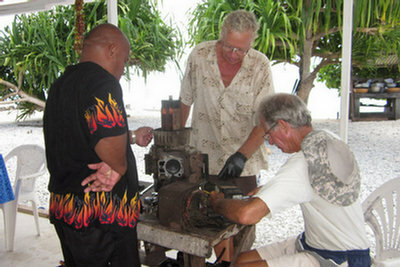 Dave and John from s/v Opus spent one whole morning taking apart the generator. John, who's an excellent mechanic, did most of the work, while Dave watched and learned, and Pumpkin and Emily produced coconuts and lunch. Unfortunately, after all morning taking the generator apart, John found a broken crankshaft. The oil had been allowed to run very low, and the engine just froze up and died catastrophically. When we were hanging out on their back porch, Pumpkin's wife Emily offered to show me how to make the elaborate baskets that she and the other Ailuk ladies make. I never did take the time to sit and learn how to do it myself, but I did get Emily to make me a few beautiful Marshallese woven crafts. On our walk around the island, we found a quiet and neat village, with the streets and yards swept clean, and no trash around. On Sunday, we were invited to Pumpkin's Assembly of God service. 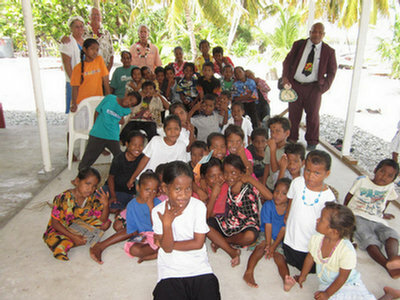 We were introduced in English, but the rest of the service was in Marshallese. We were especially taken with their practice of everyone in the church getting up from their seats and shaking hands with everyone else in the church (kind of a 7th inning stretch, before the main sermon, methinks). But the absolute highlight of our trip was when Pumpkin and Emily arranged for us to go sailing on two of the canoes. The Marshallese canoes are a proa design, and to tack them, you have to reverse the boat--the bow becomes the stern and the stern becomes the bow. They unfasten the bottom of the V-shaped sail from the (former) bow, and swing it to the new bow. They detach the rudder from the pintles at the (former) stern and move it to the new stern. Everyone turns around, and off we go again. (Sorry we didn't capture this process). In the last few hops, we've been traveling southeast, and so our weather watch was always for northeast winds. In this passage, we'd be going northeast, so we needed to wait for southeast winds. As much as people revile the GRIB, we really rely on them here. There is no real local weather forecast office. So the big computer in the sky is all we have to go on. That, and our eyes, of course. So we knew from the GRIB files to expect the wet, and the wind switch to the southeast in the middle of the day. We were all ready--goodbyes ashore said, dinghy loaded, deck canvas down, passage meals cooked, cabin prepped. So when the sky started clearing and the wind shifted, we got underway immediately. The point-to-point distance on this hop is only about 50 miles. If it was downwind, or a reach, we could have managed it as a daysail. But upwind, and tacking on 5-10 miles on each end to get from the pass into the atoll to the anchorage, we made it an overnight. We picked up anchor about 1:30pm, and were out the SW pass by 2:30pm. Once out the pass, we had to go straight east for about 6 miles to clear the SE tip of Likiep. We did the first part motorsailing really close to the Likiep coast, trying to take advantage of the little protection it offered. Then when we started feeling the waves, we fell off a bit and sailed ESE. Finally about 5pm we tacked over to head for the pass at Ailuk. We kept the motor on for another hour, until we were really clear of the reef that sticks out the east end of Likiep. At first we were making about 30 degrees true, but we got into the current, and most of the night we only made 15-20 degrees true. At dawn we were even with Ailuk Atoll, but 20 miles west of where we needed to be. So we tacked over and spent the next few hours sailing to the SE. The waves were really choppy behind the atoll--waves coming around both sides of the island meeting where we were!! 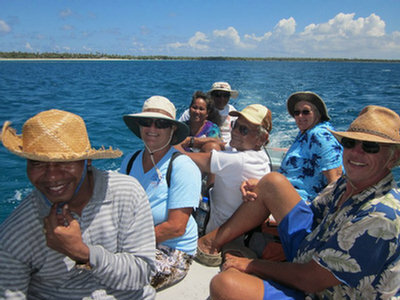 Finally we got close enough to the atoll where the waves weren't so bad, so we turned on the engine and motorsailed in. We went in the middle pass on the western side of the atoll, using Google Earth charts to navigate through the pass. As soon as we were inside, we hooked up the watermaker (directly belted to the engine, like an alternator), and made water while motorsailing the 12 miles down to the village at Ailuk. We have to motor at reduced RPM, and the wind was up, so for some time we were only making about 2.5-3 knots. We finally got anchored behind our friends on Opus about 2pm. But with full water tanks of beautiful reverse-osmosis water. I have this in my notes about Likiep: "Likiep is unique in the Republic of the Marshall Islands in that it is the only series of islands and communities that were owned by Europeans. With the intent of developing a Copra (coconut) plantation, A. Capelle, a German, and J. deBrum, a Portuguese, acquired rights to the Atoll in 1876. From then through several generations, the Capelles and deBrums dominated the culture and community of the island of Likiep and its affiliated atoll islands, running them as a company community. 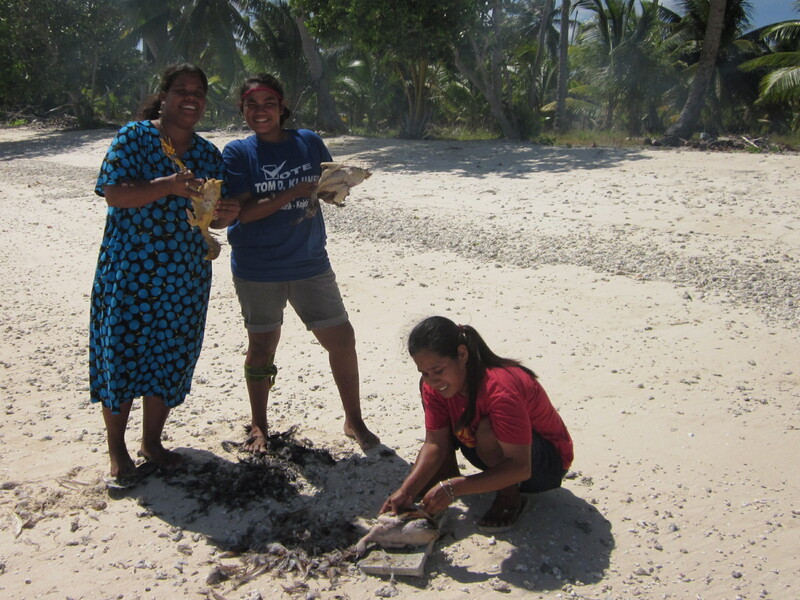 The islands seem to have prospered during the peak years of copra production." (sorry, not sure the original source, maybe Lonely Planet, maybe Wikipedia). 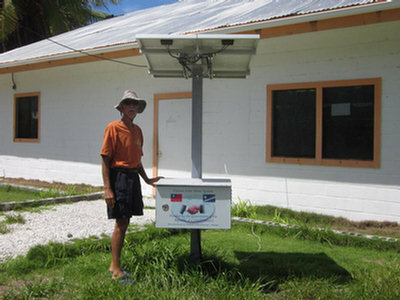 The deBrums and Capelle's are still prominent names throughout the Marshall Islands, but especially on Likiep. So when we went ashore and met "Junior" deBrum, and James Capelle, we knew we were talking to the direct descendants of these two European traders. James and his wife Samantha keep a small store, and in the store hangs a portrait of the original Capelle, whom James still very much resembles. 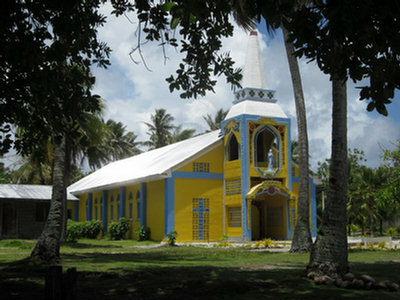 Though the descendants are thoroughly Marshallese now, the village retains just a hint of European order. We were amazed at how clean and neat everything was. We saw people regularly raking the leaves in their yards. There was none of the "Marshallese" trash that you find in Majuro and Ebeye--where every disposable item goes from hand to curb without thought of a trash can. That, combined with the thoroughly island setting, with a gorgeous beach and a nice protected anchorage, reminded me a bit of New Plymouth in the Bahamas. Everyone in Likiep made us feel very welcome. As we wandered around trying to find the "mayor", to present our paperwork, we first made our way to where the "internet" was. This ended up being in what looked like the school library. Here a satellite dish provided a one-computer internet connection and a telephone connection. 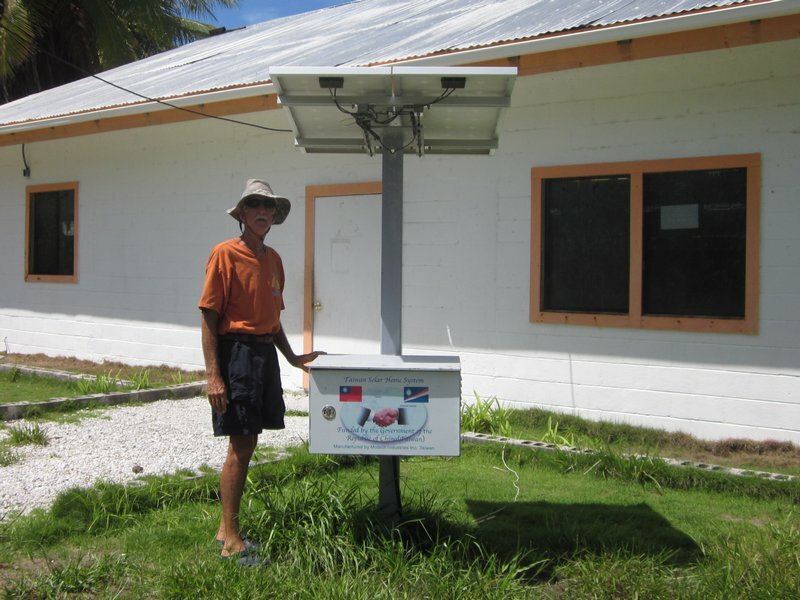 I am told that Likiep was the first outer atoll to get such service. Here we found fellow cruiser, John, from Opus, trying to check his bank balance. And here we also met Junior deBrum. 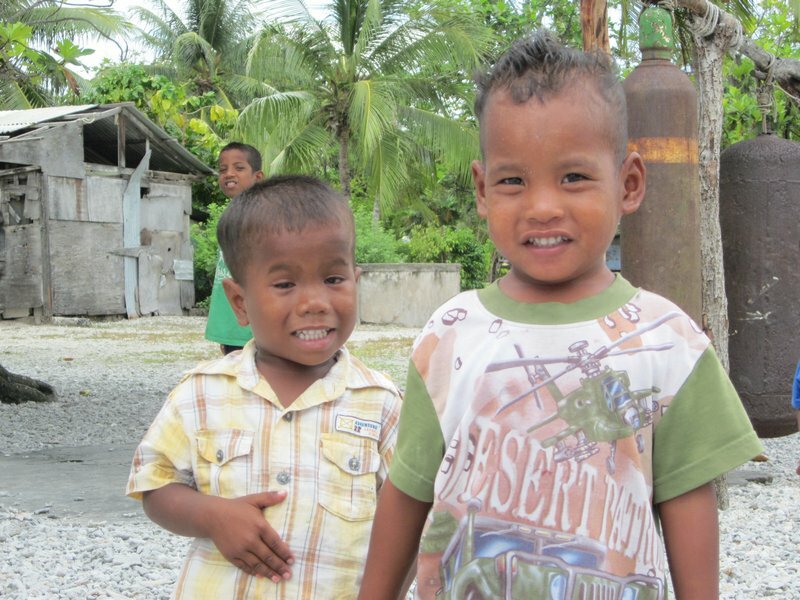 Junior grew up on Likiep, speaks excellent English, and was a wealth of information. He also offered to show us where the former deBrum homestead was (mentioned as a historical place in the Lonely Planet) and the Mayor's house. Junior is the head of the Likiep Fisheries department, and offered later to take us out to see the Giant Clam farm on a neighboring island. With Junior's guidance, next we met the acting Mayor of Likiep, Anthony John. (The Mayors of each village are usually in Majuro taking care of business, so visiting cruisers are usually dealing with the ACTING Mayor). We showed him our Internal Affairs permit for Likiep, and paid the $50 fee required to visit the atoll. He welcomed us to Likiep and answered a lot of our questions. And kindly took us to Capelle's store. The store was open but unattended, but shortly James and his wife Samantha smilingly hustled out to say hello. The store was surprisingly well stocked for an outer-island store that only gets re-stocked every 3 months when the ship comes. Of course Dave asked if they had tomatoes or papayas and bananas, and they just laughed. Normally bananas and papayas are grown on the island, but the prolonged drought had pretty much killed everything. We bought a few items at shocking prices--a can of green beans, a $6 package of Chocolate Chip Cookies, and a package of crackers I hadn't seen before. Later we sought out Joe deBrum, the operator of the Plantation Haus on the beach. He was mentioned in other cruiser accounts as being "a true friend of the cruisers". 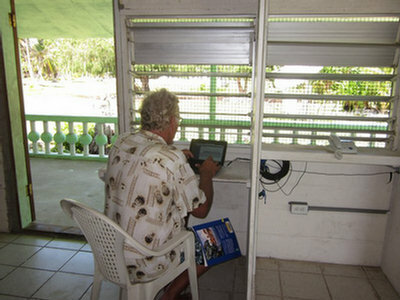 But unfortunately Joe's wife is sick, and he is in Majuro with her for the time being, though we did meet Joe's daughter and grandson, who are care-taking the hotel. 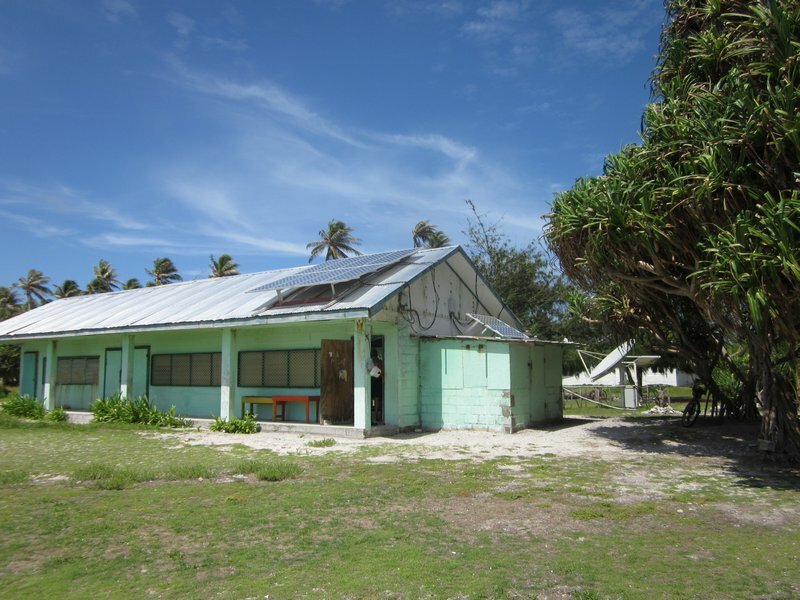 The hotel isn't open anymore, as the Air Marshall Islands service to Likiep is too irregular. As we were photographing the striking yellow church on the waterfront, we met Josef, the Catholic Priest. Later we had a chance to socialize with Josef and the two nuns who run the church, at a beach barbecue arranged by Junior deBrum. They come from other places to serve the Catholic community in Likiep--Josef is from Indonesia, and the nuns were from the Philippines. 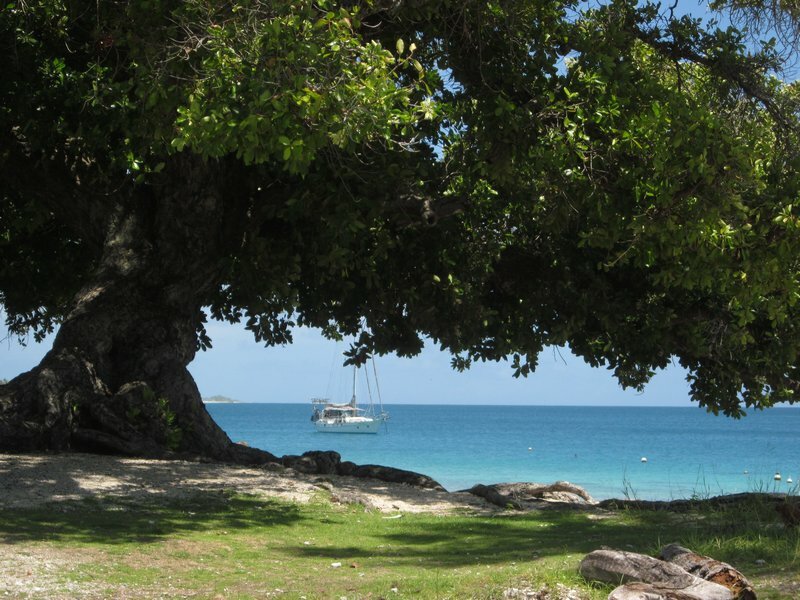 When Dave asked if there were any World War II wrecks around, Junior told him about the Japanese ship that was sunk on the reef to the SW, and the American plane that had bombed the ship, but was disabled in the attack, and landed in the water right in front of the village. Though we could find no remnants of the plane in the place Junior pointed out (right next to the wharf in front of the village), Junior recalled playing in the cockpit of the plane at low tide, when he was little. We didn't get a chance to go see the shipwreck, but a few days after we left, Junior took the crews of Westward II and Challenger out to dive on it. Stephen from Westward II told us that it was pretty broken up--interesting but not spectacular. On Sunday afternoon, Junior finally come through on his promise of taking us to see the Clam Farm, and combined it with an afternoon picnic with his extended family. He loaded one launch with family and the two nuns from the church, and us and Father Josef in the other, and we motored across to the next island to the north. While our boat made a short stop on the SE point to see the Clam Farm, the other one went to the deBrum's beach camp to start meal preparations. 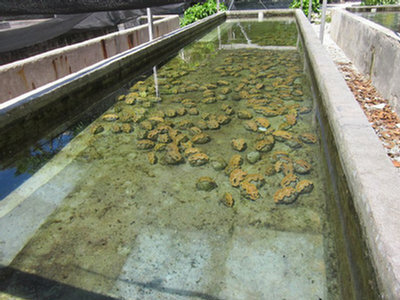 The original idea behind the Clam Farm was to re-populate the nearly extinct Giant Clams throughout the atolls. However, the lack of any regular transport between atolls has pretty much shut that idea down. Now the clams grown by Junior get shipped off to Majuro when they are about 3-6" across, and then flown to the U.S. for the aquarium market! He said his next shipment was headed for Florida!! We had a great time at the "beach barbecue". 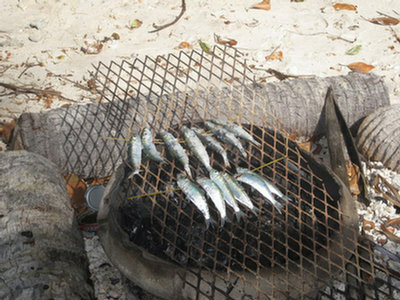 Junior's wife Titi started with live fish and live chickens and a sack of rice, and fed 5 cruisers, Father Josef and the nuns, and about 10 family members, over an open fire on the beach. 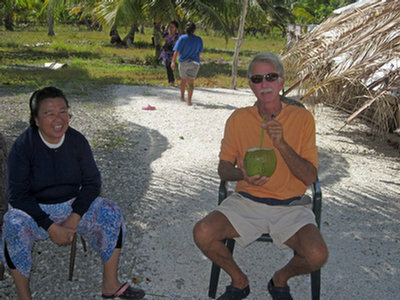 We had fresh coconuts to drink, and woven palm baskets to eat from. I got to watch the chicken operation from squawk to soup. But boy, are those island chickens chewy!! (The Marshallese must, conversely, think our farm-raised chicken are "soft"). While we waited in the shade of a coconut tree for lunch to be ready, they sent a kid after drinks for the group. 2 minutes later we had fresh coconut water, complete with a straw made out of a local reed. While the women were cooking the meal, the younger girls were getting the "plates" ready. 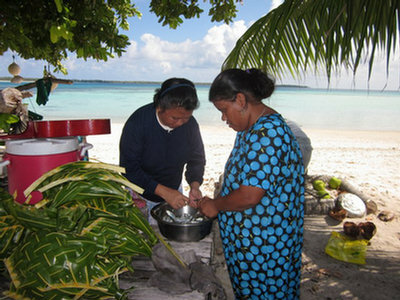 In seconds they had whacked a coconut leaf and woven a plate for us, complete with coconut leaf spoon. 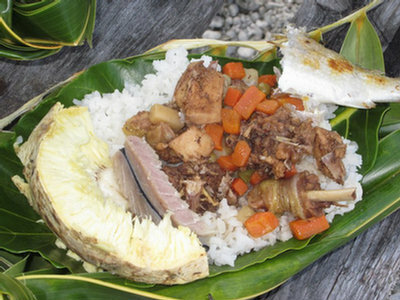 (Though the Marshallese normally use their hands to eat, they know us visitors would prefer an implement). We could have spent a month in Likiep. But Dave and I had a heart to heart about cruising plans. I REALLY wanted to go see Ailuk (another 24 hour beat to the NE). 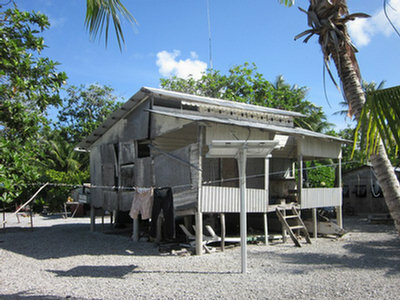 Several cruisers had said it was "the best Marshallese atoll". But Dave firmly wants to spend a good bit of time--the remaining months of the summer--diving shipwrecks and exploring old Japanese bases in the atolls of Maloelap, Mili, and Jaluit. So if we wanted to go to see Ailuk, AND see what Dave wants to see, we had to get going. So the next day, we took what looked like a decent weather window--light SE winds--to do a short overnight to Ailuk. We left the SE pass at Rongerik Atoll about 7:45am, in company with Challenger and Opus. Conditions were great. 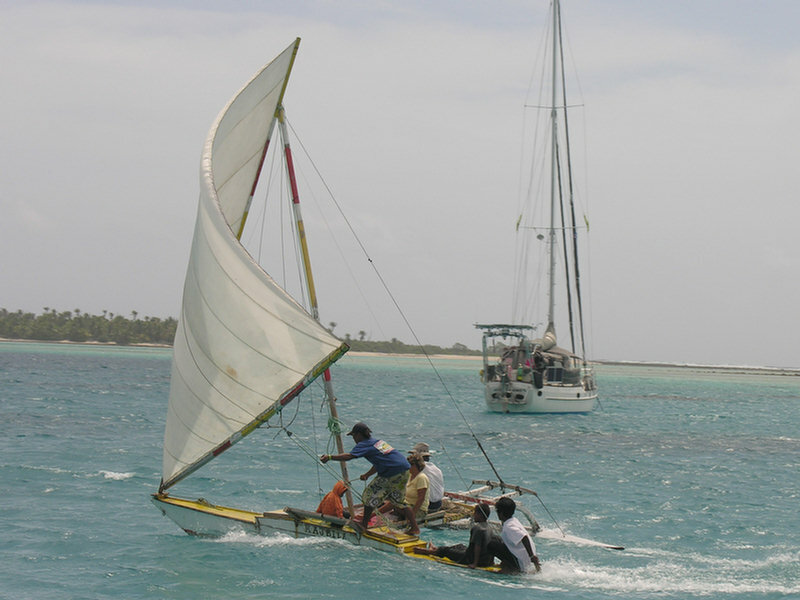 The wind had shifted as forecast more to the NE, and was down to about 10 knots--perfect for sailing to windward. As soon as we got out of the pass, we turned off the engine, and were having a great sail. For several hours we were able to sail at a good speed, higher than the direct-line course to Likiep's NW pass. At that rate, we would have arrived in the early hours of the morning. But by noon, the wind had started to shift back more to the east, and get even lighter. My 4pm log entry says "Wind less than 10 knots... We are going slowly in the wrong direction... Cranked up the engine." But an hour later we were sailing again, the wind having come back again. This pattern repeated itself all night long... too much wind, not enough wind, wind shifts left, wind shifts right. Drives ya crazy!! Our ground track from the log varied anywhere from 97 degrees to 165 degrees (with a desired course of 130T). To compound things, once we got away from Rongerik, we were feeling the effects of the persistent westerly current--probably running a half a knot from the ESE. And occasionally, when the current runs into a big bottom profile, we get weird "washing machine" waves. You'll be sailing along enjoying nice conditions, and then all of a sudden, it gets rough and choppy, with waves coming at you from two different directions. Check the chart, and yup, there's the bottom contour. We REALLY slow down when we go head-on into waves. Just the effect of the waves will drop our average speed from 5kts to about 3.5 kts. Finally about 3:30am, Dave got tired of trying to deal with the changing conditions, and "sailing slowly in the wrong direction", and pulled in the genoa, and turned on the engine. Even motorsailing, we were still not quite making the course we needed to make, but at least going closer to the proper course, and going at a more constant speed. By daylight, we were almost in the lee of Likiep atoll. We continued on our course down to close in behind the reef, tacked over, put the fishing lines out, and motorsailed NE back up the reef. We kept our fishing lines out through the pass and all the way across the atoll to the anchorage we'd picked out from the chart. Got nary a nibble. Challenger, who points a little higher than we do, and sails a little faster in light conditions, had entered the pass ahead of us, but had headed on to the SE to where the town of Likiep was. Opus came in about an hour behind us. We went straight east from the pass, to the nearest island. I wanted a swim and a rest, and to get the boat sorted out, before we dropped anchor at the town and had to interact with anyone. But when we got to the anchorage I had picked out from Google Earth (approx 09-59.6N / 169-06.8E), we found that the sand was full of coral heads. When the coral stopped, the depth dropped abruptly off to 60-70 feet deep. There just wasn't enough sand in shallow water to find a good anchor spot. We could have easily anchored in 60 feet, but we figured it would be easy to find a good anchorage further south somewhere. Well, we ended up motorsailing all the way down to the town, 12 miles south. We did stop for lunch and a short swim on the tip of a sandbar coming out from an island, but it wouldn't have been a good overnight anchorage. 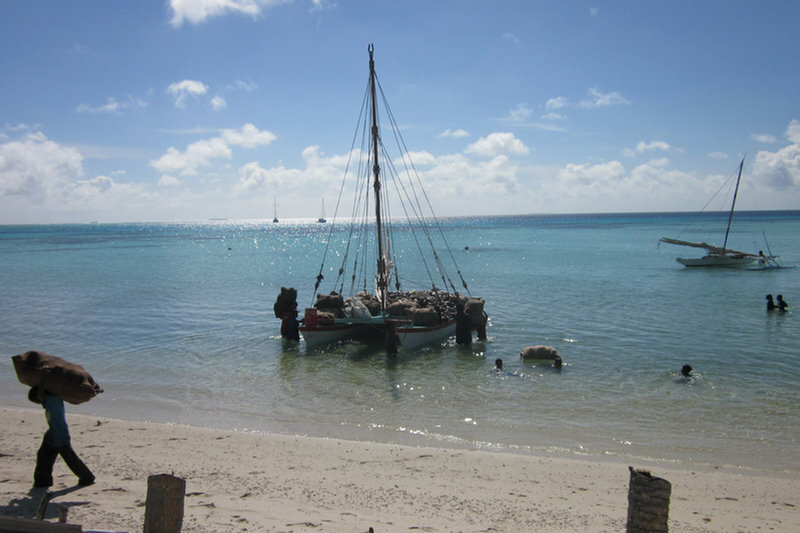 We kept looking for an anchorage that didn't have coral-studded sand, and had enough lee. But the angle of Likiep's eastern rim makes the islands line up with the wind, which was forecast to blow from the ESE for a couple of days. So there wasn't much protection. We did see one place that looked OK--at 09-55.47N / 169-12.05E. It wasn't great, though and the next island down looked better (it wasn't). We should have gone back there, but kept heading SE. The first decent-looking anchorage had some houses ashore, so we carried on to the main town. Passage recap: Point to point distance covered - 140nm at 129T. Tacking and navigating inside the lagoon, we covered 180nm over the bottom in 35 hours, 15 hours of it with the engine on. In snorkeling around the anchorage at Rongerik, we found more big giant clams than we have ever seen. In French Polynesia and everywhere west, you do see them, but they are small--4 to 6 inches across. On the little patch reef right next to us, we found 3 GIANT clams--each 3-4 FEET across. There were also a lot of smaller ones laying about in the sand. So many that I felt OK with taking one to eat. I picked the smallest one I could find--about 10" across--to take back to the boat. When they're just chilling on the reef, their clamshell is open and their mantle is hanging out. They look like the meat is too thick to be able to close up all the way. Poking them gently while snorkeling, I've only ever seen them half shut. It looks like a huge amount of meat. But I had been told that once you clean it, there isn't much meat left over. By the time I snorkeled mine back to the boat, I had dropped it a few times underwater, and frightened it enough that it was closed tight. So the first step was figuring out how to get it open. I really wanted the shell to keep, too, so I didn't want to bash it open. What to do... what to do? I finally left him in a bucket in some water until he opened up a bit. I tried to sneak up on him and put my oyster knife down in there sideways to keep him open, but wasn't fast enough. He closed on the blade. So I put him in a big ziplock bag (with the oyster knife still stuck in) and put him in the freezer. The next day, he was much more cooperative! Since I had left the oyster blade jammed in, it was possible now to twist it a bit and get a filet knife down inside the shell and cut the muscle from the shell. Then it opened easily. But I was surprised to find that the mantle was now only about half there. Apparently the big meaty looking mantle that is there when they are open on a reef, is mostly water (which, I found out later, had ended up leaking out of the ziplock bag and draining into the bottom of my freezer!). So half of the expected meat was already gone. Then, when you separate the guts out, that's another third. The other two thirds of what was left, I separated into 2 small piles--the big muscle, and what was left of the mantle. I nibbled on the muscle, and it looked and tasted like a scallop. I kept that. A nibble on the mantle produced an "Eeewwww". The mantle looked and tasted like leather. I discarded that. So from football-sized giant clam, I ended up with a piece of edible muscle 1-inch in diameter and about 3-inches long. It was good, but as I had been told, not much meat for what you start with. Later one of the islanders told us that they do eat the mantle. They mince it up and make "clam chowder" out of it!! (But it still looks a little repulsive). 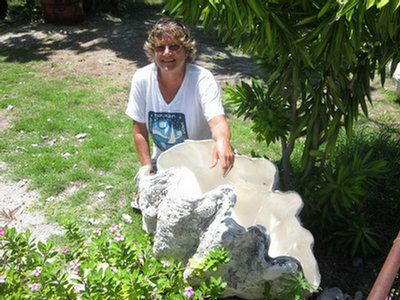 We were told that the world record Giant Clam lives somewhere in the Rongerik lagoon--7 feet across. P.S. Another Giant Clam adventure: Westward II, on pulling their anchor the last day at Bikini, had found a 2-foot clam clamped on to their anchor chain. It took them about 15 minutes of pushing and prying, and finally bashing it with a crowbar, before they could get it off. Rongerik Atoll is where the U.S. Government relocated the Bikinians, when they co-opted Bikini Atoll for nuclear testing. 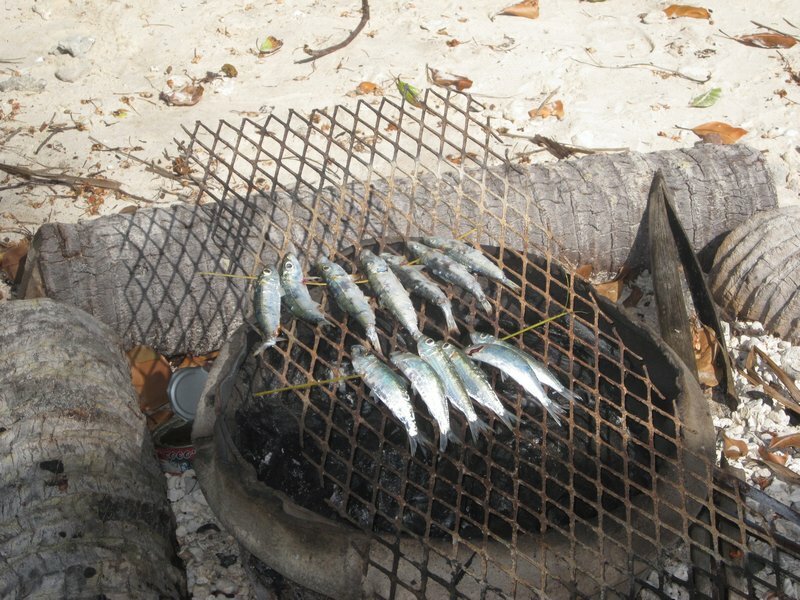 However, I guess they didn't know at the time that Rongerik was uninhabited for a reason--apparently most of the fish in Rongerik Atoll were "poisonous" (ciguatera or something else, we're not sure). So the Bikinians almost starved to death before they were relocated to another island--Kili--in 1948. Since then Rongerik has been uninhabited. 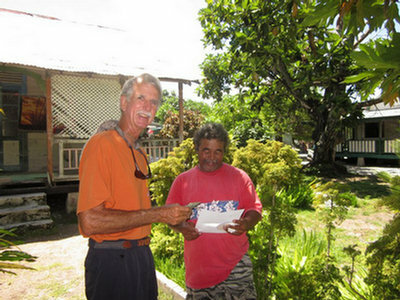 The Marshalese think it is "haunted" and don't like to go there. 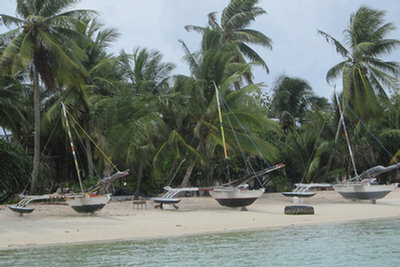 An uninhabited atoll is always an attractive cruising destination. 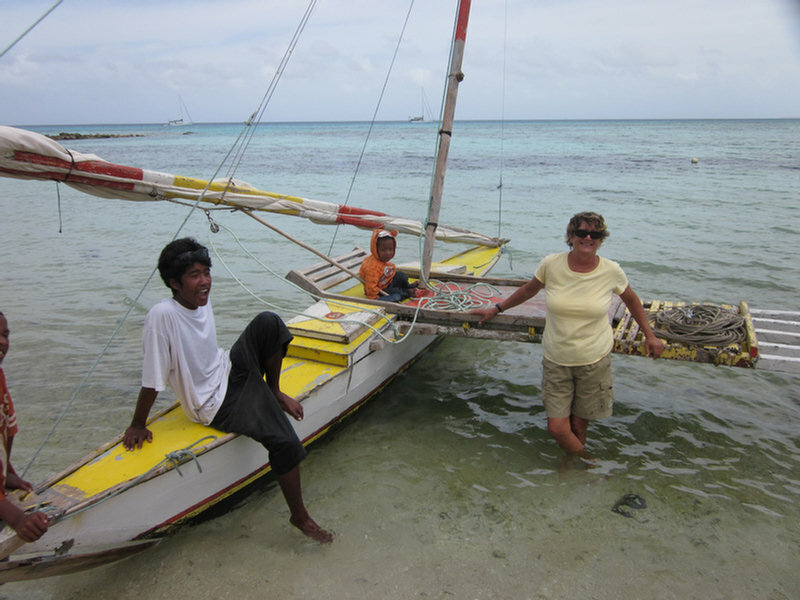 While we love to interact with the islanders, it is nice to be able to do whatever we want without worrying about asking permission (ie to go ashore), breaking some village rule, or offending someone. Also, the inhabited atolls are feeding themselves off the reef, so things are much more "fished out". 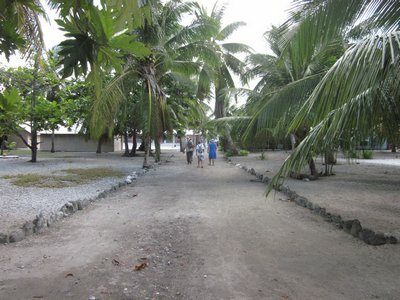 But Rongerik is seldom visited by cruisers because it is one of the atolls which you can't get permission to visit from Internal Affairs in Majuro. It is also west of the easy-to-reach-from-Majuro Ratak chain of islands. We found, however, that it turns out to be easy to get permission--you just have to go check in at Rongelap, and get their permission to visit Rongerik. That permission seems to be freely given--and includes the warning that the fish are poisonous and it the atoll is haunted. And for us, working our way west-to-east, instead of being out of the way, it was a necessary stepping-stone. We had been given a waypoint for a good anchorage by another cruiser, and a place where it was easy to get to the windward side of the atoll at night for lobstering. Our friends on Brickhouse has also blogged about their trip there the year before--when they found 7 big glass Japanese fishing floats (aka glass balls). So we ended up there with two other boats--and everyone was hoping to find that magical mythical "glass ball" for themselves. Opus and Challenger had arrived the day before, from Rongelap. And they had immediately set out to "beachcomb" every windward beach near the anchorage, Challenger heading to the small islands to the north, and Opus to the south. We thought we were probably too late to find anything when we got there a day later. But when we went out the next day beachcombing as a group to a further island, we still found a few things to clutter our boat up with. The shelling was excellent. Though Jerry had already found the only big glass ball that any of us found, we did find several small glass balls--even on a beach that had been "done" the day before. We also found an island where the turtles were laying eggs--with several tracks in the sand from the night before. We talked about getting up in the middle of the night to see if we could catch a turtle laying--but never did. We did go out one night walking the reef for lobster. It seemed a perfect night--low winds and some moon, and the low tide in the early evening. But I think we got there a little early, and just when the tide started rising (when is supposedly the best time), a squall came along and we abandoned the effort. We did get Opus their first lobster, though. They spotted all 3 of the lobster we found before we retreated to the boats--and Dave picked them up with his net and tickle stick. One was a female with eggs, and we let her go, and gave Opus the other two. We thought we'd go out the next night, but after beachcombing all the next day, we were too tired, and never did go back out there. (We still had lobster in our freezer from Bikini, though). On one windward rocky shore we were walking, we also found what looked like a recently-wrecked personal sailing canoe. We looked around for signs that someone might be shipwrecked, but didn't see any footprints or anything. Hopefully it just floated off a beach somewhere, unoccupied. We took pictures of the canoe to show to the other islands upwind. We have since learned that each clan has a different color scheme, and this one may have come from Utrik (neither Likiep nor Ailuk said it was one of theirs). We talked about going diving, but didn't stay long enough. Westward II, who probably would have provided the push we needed, were still in Rongelap. Dave and I and Jerry from Challenger did spend an hour snorkeling the big coral patch within easy swimming distance of our anchorage. It was really nice, and had the biggest "Giant Clams" we have ever seen. The last night, we moved south to a not-as-protected anchorage off Enewetok island, at the SE end of Rongerik. This is an OK anchorage in E-SE winds, but not so protected in NE winds. But it was a convenient place to jump off in the morning for our windward beat to Likiep. We only stayed a few days in Rongerik. Again, we could have easily spent 2 weeks there, but another good weather window came up, and we just couldn't pass it up. We are starting to get low on provisions. If we want to see a few more atolls before we head for Majuro to reprovision, we need to keep moving. Next stop: Likiep Atoll.